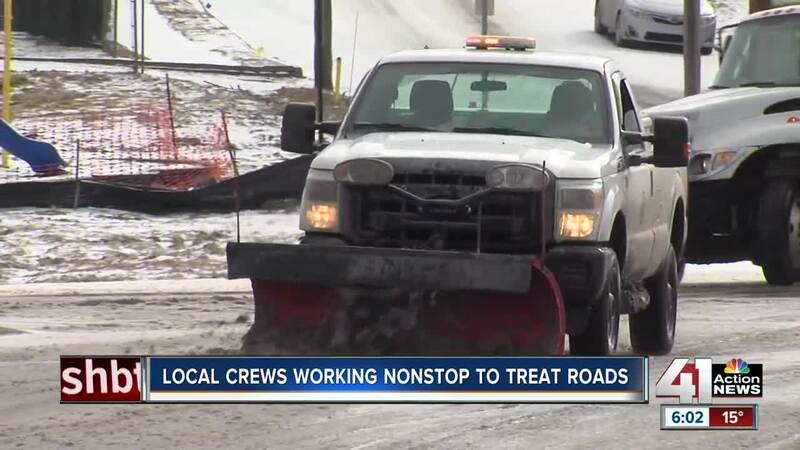 Street crews in KCK will work into Thursday night to take care of icy streets and prevent refreeze. KANSAS CITY, Mo. — Crews were working Thursday evening to tend to ice side streets after a Wednesday night ice storm. “This storm was very different than any of the ones we've had this winter. We had combination of ice, freezing drizzle, hail, thunder, snow and sleet. This gave us whole different operational method for this one,” said Mike Tobin, public works director. Tobin said since 7 a.m. they've run around 30 complaints, which he says is pretty good. “This is almost like driving through sand, it's got a real strange consistency to it. I mean one of our trucks last night was getting hit with hail,” said Tobin. Crews started Wednesday on primary and secondary routes, then neighborhoods. They went back through on Thursday. Tobin said the trucks never ran out of salt. Salt doesn't work when the temperature hits 17 degrees. The UG doesn't use other de-icing chemicals, so Thursday night they'll hit the streets with both salt and sand to prevent refreezing. “A normal winter in this part of country, you run about 20 events. And hopefully they don't all come in the same two week period. We're getting close to that. We're over 10 events and there's one forecast for Sunday, one for next Tuesday,” said Tobin. Tobin said Public Works is still under budget this year. KCK is hilly, so a lot of those streets are still covered. If your street still needs to be plowed or salted, call the Snow Removal dispatch line at (913) 573-8307. For information about snow routes, click here .